Creativity is intelligence having fun, according to Albert Einstein. But can you run a business based on creativity, which is traditionally the realm of artists, musicians, and writers? The stereotype has them setting their own hours, wearing nontraditional attire, acting independently and not earning much. 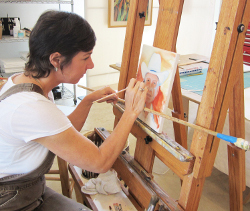 At Tipsy Canvas, adults enroll for an evening’s painting instruction. In “The Rise of the Creative Class,” author Richard Florida gave an entirely new definition to the term creative class, which he describes as the cadre of knowledge workers and information technologists who are vital for economic growth. Florida said those techies, who value individuality, meritocracy and diversity, seek communities that have vibrant art, music and creative outlets (the traditional creative class) and other signs of a higher quality of life. As the border region strives to attract new, high tech businesses, a climate that supports artists and musicians has become a critical factor for economic development. Already, enlightened Valley businesses sponsor arts programming such as symphonies, museum exhibitions, and performances while buying works of regional artists and writers. The Valley, which has always had artists, is beginning to give more visibility, commissions and gigs to a wide range of artists from architectural blacksmiths and portrait painters to graphic designers and jazz musicians. In Brownsville, artist and former Smithsonian curator Mark Clark runs Gallery 409. Dozens of murals brighten the exterior of Harlingen businesses such as Antiques Emporium, Books N Things and Shaub Art Studio. Downtown District merchants have commissioned two new murals. 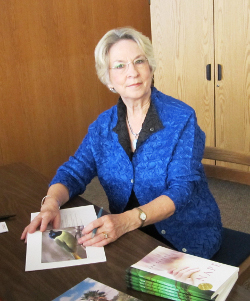 Texas Poet Laureate Jan Seale signs copies of her books after a reading. In McAllen, Nuevo Santander Gallery, an anchor of the Art District and a founder of the monthly Art Walk, continues to showcase regional artists along with colonial and ranch artifacts. 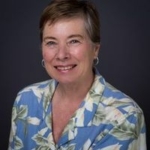 The 2012 Texas Poet Laureate is Jan Seale of McAllen. Music, dance and art classes and the stores supplying appropriate tools and accessories operate in the region’s larger communities. Artists consign their works to galleries, which charge fees between 15 and 40 percent to sell them, so they can concentrate on the creative side. Art Village, which covers an entire McAllen block, opened three years ago to provide a central venue for art-related businesses, according to Yoli Cantu. 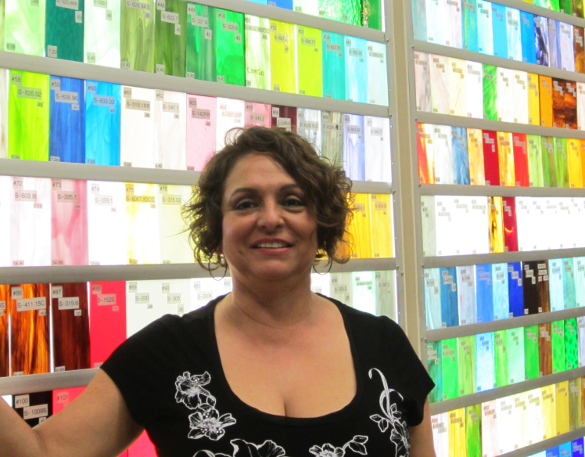 She is the owner of McAllen Stained Glass and with her husband, builder Alonzo Cantu, designed the studios and office spaces. Yoli Cantu creates stained glass panels and teaches at her Art Village gallery, McAllen Stained Glass. Cantu, who began working in stained glass in 1986 as a hobby, soon moved on to creating custom stained glass panels for clients. After that, the onetime kindergarten teacher expanded into teaching formal glass art classes for adults. Cantu was commissioned to create the new McAllen library’s murals, which measured 12.5 feet by 7.5 feet each. The stained glass panels took five months of long, long days and required the help of other artists, friends and her father, in order to meet the deadline, she said. Cantu’s walk-in traffic peaks in winter as Winter Texans taking art classes in their parks come into buy supplies. The rest of the time Cantu concentrates on commissioned work and classes. Last summer Cantu developed a two-week summer camp for kids six to 12 years old and will have it again this summer. Rodrigo Rodriguez relocated his production company Rio Bravo Films from Houston to Art Village over two years ago. “We love it. We feel at home,” said Rodriguez. In offices decorated with movie posters of Mexican action heroes and Addy awards, the company creates commercials, films, and websites for hospitals, banks and other ad agencies. Fifty percent of their clients are outside of the Valley and the group recently completed a film for a Houston company that will be aired in China. “At the high end, where we are, the market is very strong,” he said. The owner of Serena Pandos Gallery, the newest Art Village tenant, walked away from an arts administration job to return to her creative side. She is organizing a young people’s studio in the summer time and teaches watercolor and drawing workshops on a weekly basis. Susy’s Dance & Fitness covers two floors of spacious studios where flamenco, ballet, jazz, tap, break dancing and other classes are held. At Buttercream Café, where parents sip coffee and snack while their children attend classes, a split screen TV broadcasts real-time images of Susy’s classes. 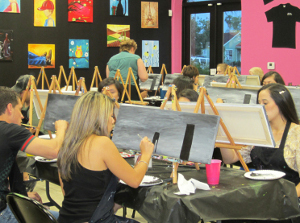 In contrast, inside Tipsy Canvas on Thursday, Friday, and Saturday evenings, budding adult artists paint on canvas as an instructor guides them step by step in painting the evening’s assignment, which could be a city nightscape, a landscape, or a spray of poppies. Other Art Village tenants include, web designers MPC Studios and Imagine Showroom. Musicians who tour internationally have described UTB’s Arts Center as one of the best halls they have played in. 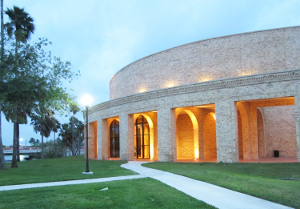 In Brownsville, the superb acoustics and outstanding design of the Arts Center at UTB has prompted internationally renowned musicians to call it one the best halls they’ve played in. The two year old performance hall has scheduled string quartets and orchestras, jazz singers, dance troupes, the road company of “Fiddler on the Roof,” the Guitar Ensemble Festival, and much more for the next season. Gallery 409, set in Brownsville’s second oldest building, has grown into a popular venue because of the frequent art shows of border region artists. The Frontera Jazz quartet performs here occasionally.